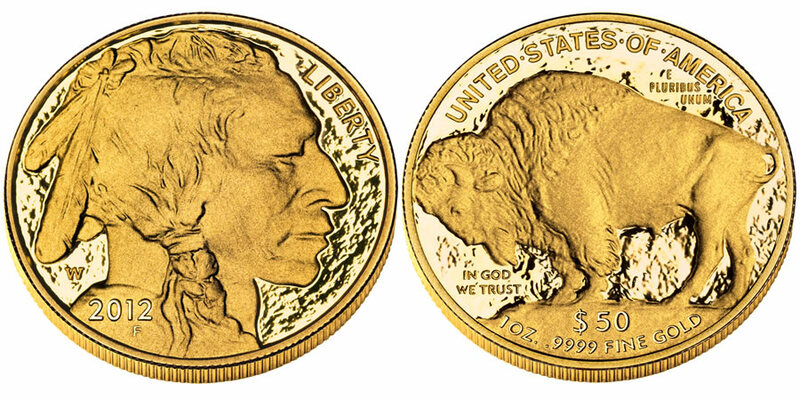 The 2012 American Buffalo Gold Proof Coin will be the seventh year in which the United States Mint issued a coin in the series. The inaugural strike of the American Buffalo Gold Proof Coin appeared in 2006. An Act of Congress which authorized an associated series of bullion Buffalo Gold Coins required that each be struck from one ounce of .9999 fine 24-karat gold with these numismatic versions featuring those same specifications. At the time of their debut, the Gold Buffalo Coins were the first to be struck by the US Mint from such a fine grade of the precious metal. Most familiar with historic American coinage will recognize both the obverse and reverse imagery of the Buffalo Gold Coins. They are based on designs completed by James Earle Fraser for the 1913-1938 circulating nickel known by many as either the "Indian Head Nickel" of the "Buffalo Nickel." James Earle Fraser designed the obverse to showcase the profile of a Native American. Also shown on the obverse are the inscriptions of "Liberty"and the year. A "W" mintmark is shown as well indicating it was struck at the US Mint's West Point facility.. The reverse contains the image of an American Buffalo also known as a bison. It was designed by James Earle Fraser as well. Reverse inscriptions include "United States of America," "E Pluribus Unum", "In God We Trust," "$50" and "1 Oz. .9999 Fine Gold."